Disney’s all-new Cinderella has arrived!! It’s a live action version of the classic fairy tale that we love and I’m so excited to see it! So, I decided it would be fun to make some themed treats to enjoy. 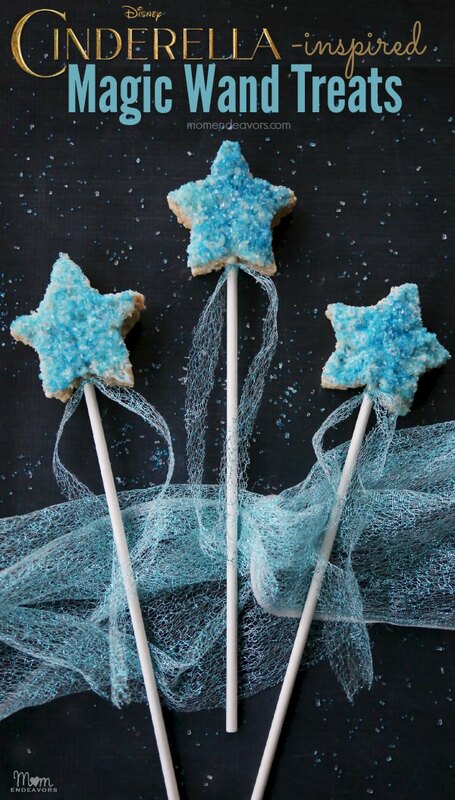 And since Cinderella wouldn’t even get to go to the ball at all if it weren’t for her Fairy Godmother, I thought some magic wand treats were appropriate! In the movie, there is no giant star on the end of the wand. But, these wands are whimsical & fun (just like the Fairy Godmother) and the blue tones of course go with Cinderella’s beautiful ball gown. Kids will love them and they really are quite easy to make – just a regular batch of rice krispies treats (cut in stars), dipped in white chocolate/white candy coating and covered in sanding sugar! We did the same process for our Disneyland-inspired Pumpkin Mickey treats and those were a big hit! You’ll start the wand-making process by whipping a batch of rice krispies treats. I wanted mine thicker so I put the batch in a 9×9 pan, spreading everything out in the pan to get a nice even layer. Once cool, I cut out the stars with the cookie cutter. Insert the lollipop sticks into the star cut outs. Then, melt some white candy coating (I used 3 chunks and I always melt in the microwave). To make things easier for dipping, I just poured the melted “white chocolate” on my silpat. 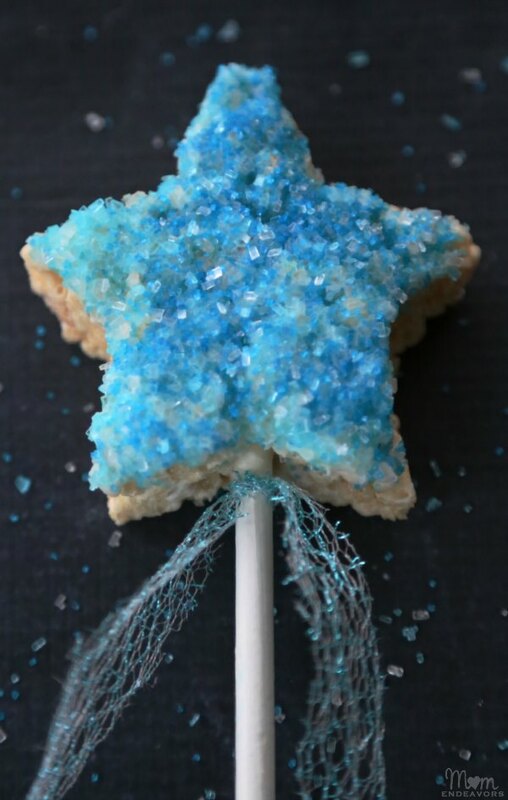 Then, I dipped one side of the stars in the melted candy coating. 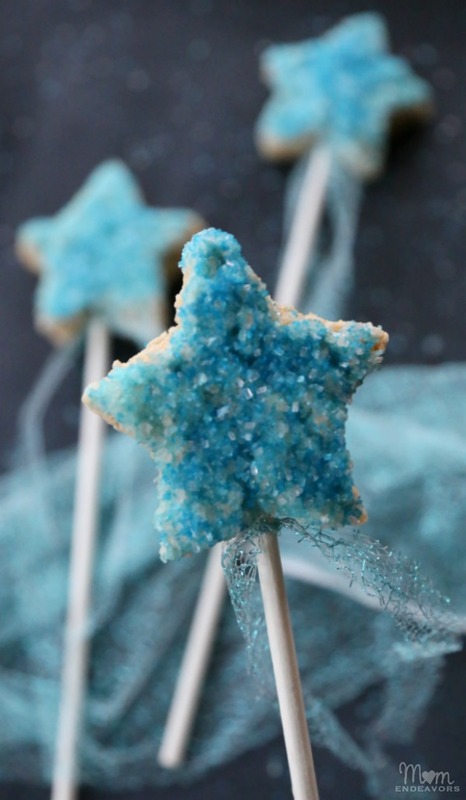 Immediately after, dip the coated star in blue & white sanding sugar (which I just spread out on a paper plate). Place in the refrigerator for faster cooling time if you’d like. Then, tie ribbon(s) or cut fabric on the stick for some extra whimsy. The fabric I used had just the right amount of sparkle (some fun material left over from our FROZEN party). So fun and such an easy way to have a little Cinderella magic at home!! 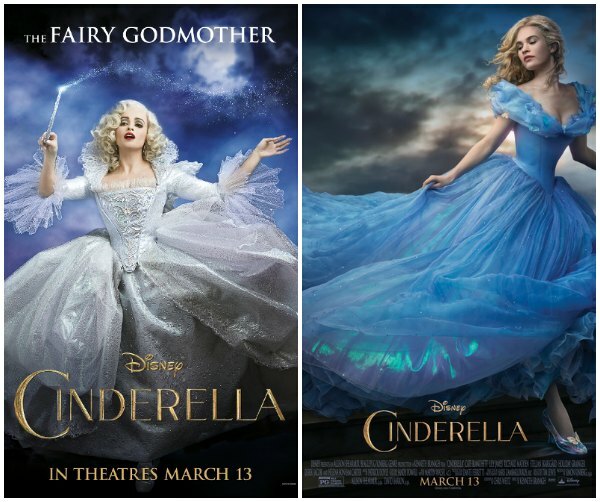 Are you excited for Disney’s Cinderella? Have you seen it yet – what did you think? Hi! I absolutely love this idea and I was hoping to make some for some of my classmates. I was wondering if you knew about how many servings your recipe made? Thank you.